The LT Time Allocation Committee has issued the Calls for Proposals for Semester 2018A (1st Jan 2018 → 31st Aug 2018 inclusive). See below and the Call for Proposals page for details. After taking off 20 hours set aside for Reactive Time and 19 hours allocated in previous semesters, there are 261 hours available to be allocated for PATT in semester 2018A. Due to a previous problem with the new PATT/JMU submission system, the deadline for submission of PATT proposals has been extended to Friday 6 October at 5pm GMT. Full details of the Call for Proposals are available for download as a PDF file from here [CallForProposals-PATT-18A.pdf]. 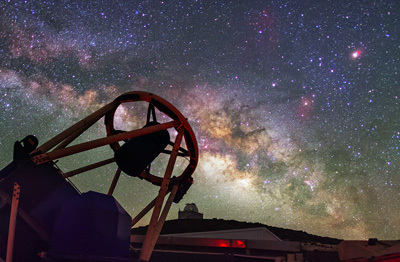 The file gives more information about the proposal process, reactive time applications, new and existing instruments, and the telescope's performance and rapid-response capabilities. After taking off 9 hours set aside for Reactive Time and 6 hours allocated in previous semesters, there are 285 hours available to be allocated for JMU in semester 2018A. Due to a previous problem with the new PATT/JMU submission system, the deadline for submission of JMU proposals has been extended to Friday 6 October at 5pm GMT. Full details of the Call for Proposals are available for download as a PDF file from here [CallForProposals-JMU-18A.pdf]. The file gives more information about the proposal process, reactive time applications, new and existing instruments, and the telescope's performance and rapid-response capabilities. The deadline for submission of CAT proposals is 17:00 GMT on Tuesday, 3rd October 2017. This deadline is unaffected by the previous problem with the PATT/JMU submission system.